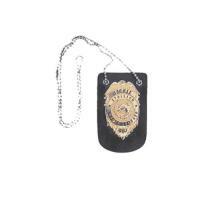 This Stallion Leather Neck Chain Badge Holder is constructed from strong, heavy duty leather with a top grain finish for quality and durability you can trust. Punched pinholes accommodate standard badges in Shield, Federal, or Star styles. The badge will hang halfway down your chest, and Stallion has designed the chain to break away if pulled or caught during an arrest so as to avoid injury to your neck. Stallion offers this badge in black, for a classic look, or cordovan brown.